While scaffolding can be useful in a variety of situations, it helps to think about your task before choosing a type of scaffold to work with. Watch this video for a brief overview of the different types of scaffolds. When you are tasked with working high above the ground, you’ll need a work platform. Suspension scaffolds are supported from one or more points overhead, while self-supporting scaffolds get their support from the opposite side. 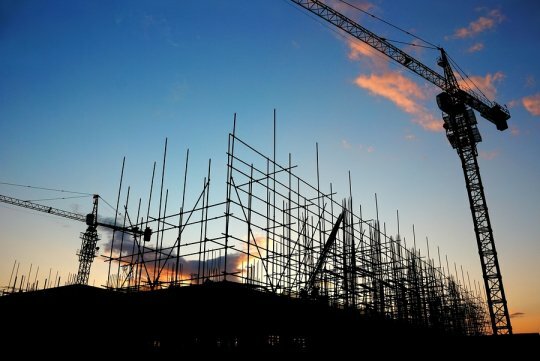 Scaffolds may also be mobile, which can be helpful and even necessary for certain construction projects. You can always have your scaffolding professional point you in the right direction when you are unsure of your needs. Scaffold Resource is proud to offer shoring and scaffold rentals in Washington, D.C., and we are happy to help your company with your work platform needs. Please do not hesitate to call us at (301) 924-7223 to learn more about us. Certain conditions can make a construction site dangerous, but shoring techniques can be used to keep the area safe. If the project your construction team is working on may potentially collapse, you can use shoring erection to stabilize the area and perform your work. Keep reading for a look at some common shoring techniques. If a structure’s foundation is not stable enough for your team to work comfortably and safely, underpinning might help. This common shoring technique is used to bolster the stability of the foundation, and it does so by redistributing the load over a wider area. Underpinning repairs an existing foundation, which prevents the need for the building of a new one, and it is a popular choice when the supporting soil has suffered a loss of integrity. This technique also tends to be on the cheaper side, giving your company an opportunity to save funds. Soil nailing is another shoring technique that seeks to provide additional structural integrity. After drilling a hole into a retaining wall or soil slope, you can insert steel bars or other thin, strong materials to act as reinforcements. Once they are grouted into place, you can enjoy a more structurally sound soil slope or excavation. The structural integrity that this shoring technique offers makes for a safer and more efficient work environment. When your goal is to keep a trench from collapsing, hydraulic shoring may be the ideal shoring technique for your project. This method makes use of hydraulic pistons, which support the trench walls with the help of plywood, a steel plate, or other strong, durable material; if you are going to be using this method with plywood, make sure you choose heavy enough wood for maximum security. If you would like to learn more about these common shoring techniques, feel free to call Scaffold Resource at (301) 924-7223. We specialize in shoring erection near Washington, D.C. and would be happy to take care of your business’s scaffold and shoring needs. Please visit our website or stop by and see us for more information. Why Should You Work with Scaffold Resource? If you plan on working on a scaffold, shoring system, or other work platform, it’s important that you rent from a trustworthy company. Scaffold Resource will make sure you enjoy the comfort of working on only the steadiest platforms. Keep reading for a close up look at why you should work with Scaffold Resource. At Scaffold Resource, we are committed to providing exclusively high-quality work and treating our customers with the care and respect that they deserve. We have been continuously growing, learning, and sharpening our skills since our inception in 1996. 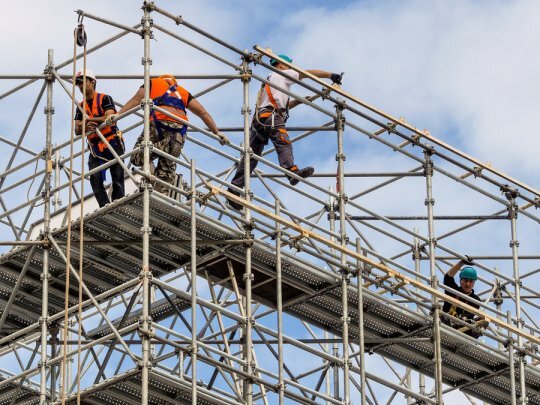 Our team members are trained professionals who are dedicated to providing your business with the scaffolding, shoring systems, and work platforms that you need to get the job done. From the Lincoln memorial to the Chesapeake Bay Bridge, we have had the opportunity to work on a wide range of intriguing and historically significant structures. Are you interested in working with Scaffold Resource ? Give us a call at (301) 924-7223. Our team specializes in shoring and scaffolding rentals serving Washington, D.C. If your business needs scaffold resources or a shoring rental, feel free to come by and meet with us for more information today. What Are the Most Common Types of Scaffolds? When it comes to painting buildings or installing new windows on the twentieth floor of your workplace, a scaffolding rental may be a necessary part of the equation. There are a handful of different types of scaffolds, and each may be ideal for a different situation. Continue on to learn about some of the most common types of scaffolds. Scaffolds are elevated platforms that support workers who are tasked with working on tall buildings, monuments, or other large structures. While stationary scaffolds can get the job done, mobile scaffolds can allow you to access a greater area without taking your platform apart and rebuilding it. Mobile scaffolding may be perfect for washing the windows of a skyscraper or painting the side of a building. As long as it is properly constructed and inspected, a mobile scaffold can be a safe and effective tool for a variety of purposes. Your work platform needs to be supported in some way, and suspended scaffolds are supported from above. Supportive cables will be used to hang your scaffold from the roof, the top of a monument, or other overhead structure. Suspended scaffolds are typically used for especially high up jobs; if you are working on the fiftieth floor of a building, scaffolding supported from the ground may not be practical. This type of scaffolding might also be used when the ground lacks enough structural integrity for the building of supported scaffolding. Supported scaffolding is typically the go-to choice for many jobs. Unlike suspended scaffolding, supported scaffolds are built from the ground up. Its safety and efficiency make it the most common type of scaffold, and it is often used in construction. There are a few different types of supported scaffolds, so talk to your scaffolding professional to see which one is right for you. For more information about your scaffold options , contact Scaffold Resource. In addition to scaffolding rental serving Washington, D.C., we offer shoring and scaffold resources. Please do not hesitate to call us at (301) 924-7223 to learn more about our work platforms today.